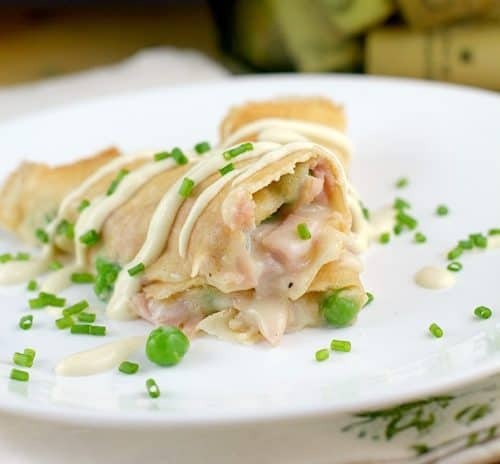 Tender tasty ham and spring peas, loaded into delicate crepes with an abundance of cheese. 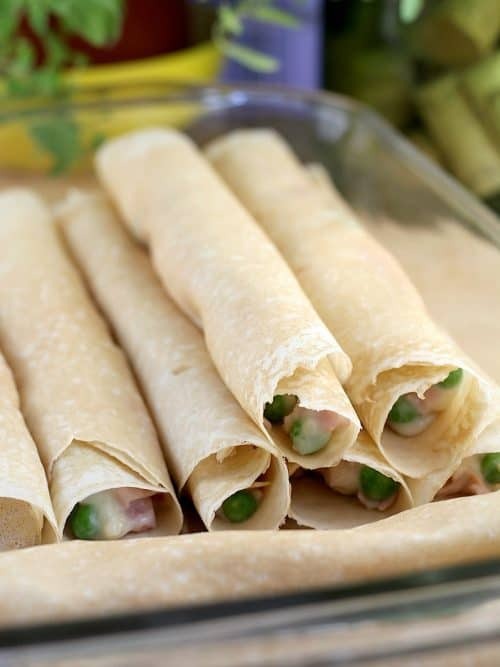 This easy Ham, Peas, and Cheese Crepes recipe is perfect for family, for dinner, spring gatherings, and sharing. 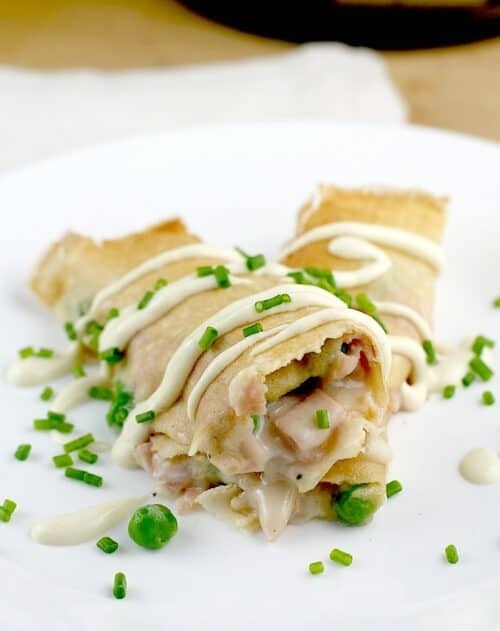 Tender tasty ham and spring peas, loaded into delicate crepes with an abundance of cheese. This easy recipe is perfect for family, for dinner, spring gatherings, and sharing. This this this! This recipe is fantastic. It came together so quickly and got such rave reviews that this will now be a go-to in my I-want-to-look-like-a-rockstar-but-I-don’t-want-to-have-to-work-too-hard arsenal. Yeahhhh. Because that is just the thing this time of year – it’s spring! We want to gather, we want to come out of hiding and have all the fun. Showers, picnics, BBQs, Bunco night, more showers (doesn’t like everyone get married in the spring? …although, I got married in December, so I guess that doesn’t work). 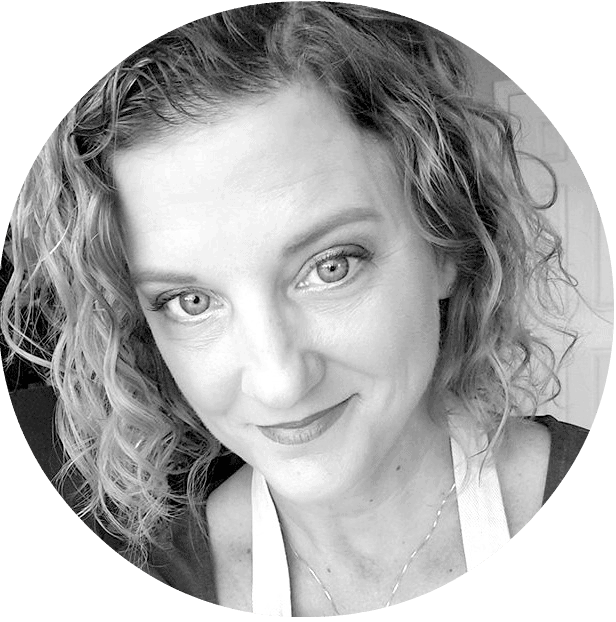 But you know what I mean – we need recipes for company, we want them to fit the season, and we want them to be fabulous. Easy, and fabulous. And quick. So with that in mind, I give you my new crepe. Voila. Comme ca. So what did I do here ..I made a lovely, DELICIOUS cheesy sauce to start. Cheeeeese. So good. 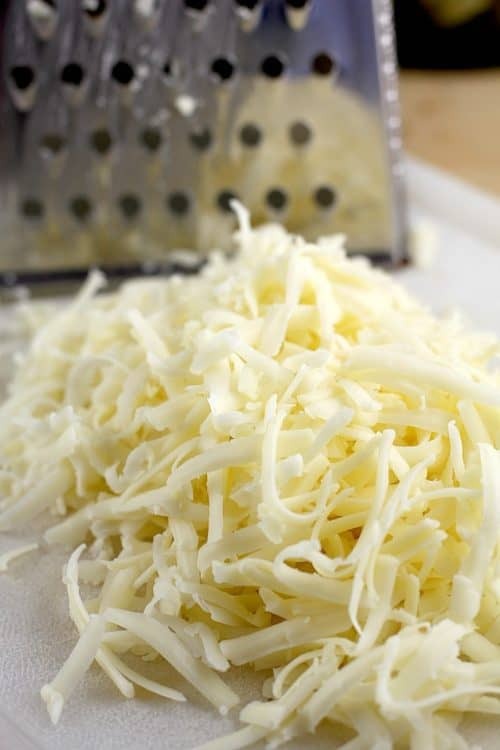 This is a basic cheese sauce – we start with a roux, then milk to make a bechamel. Then just a couple ingredients required for flavor, and 2 cuppers of cheese. I used white cheddar because 1) it is yummy, and 2) I wanted to keep the sauce white. Just seemed more elegant to me that way. The deli meat I used, Castle Wood Reserve®, was a hit with my family. They loved the flavor. While I was using half the package in the recipe, they sat there munching on the rest of the package right then and there while I was cooking. Castle Wood Reserve® is a new-to-me line of deli meats. I found it in the deli section at Walmart, and they have no binders or MSG or such. 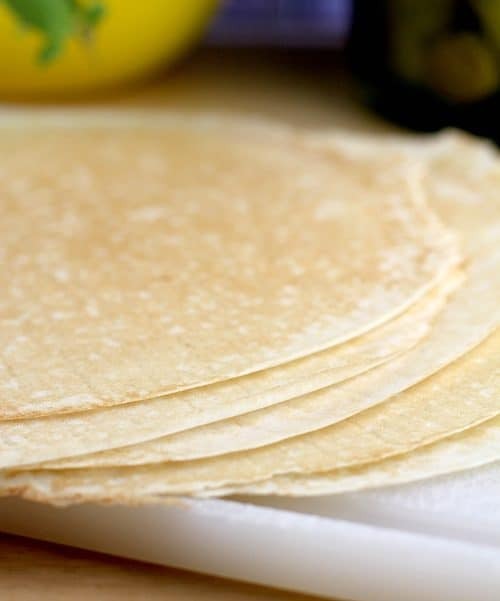 So you can use it as almost an easy hack in a recipe like these crepes because it is deli meat, or put it right out there with cheeses, olives, and such for a charcuterie board. Moving on, once our filling is ready, we roll it up enchilada-like in the crepes. Now, sometimes I make crepes, and I linked my recipe in the instructions below. But sometimes, oftentimes, I don’t have that time so I buy them. Yes, you can get them already made – I find them in the produce section. No shame, right? 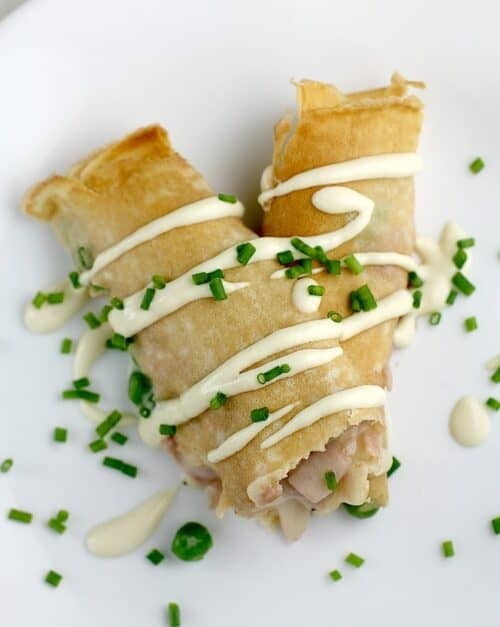 Then we just bake our crepes, make a little Dijon cream sauce for topping and We. Are. Done. ..See? Totally easy. And really truly delicious. So that’s it folks! 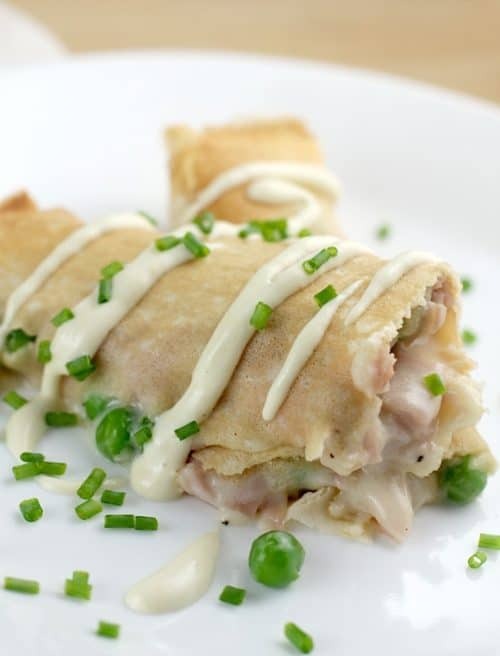 An elegant but EASY Ham, Peas, and Cheese Crepes recipe, filled with ham, peas, and cheesy cheese. An impressive spring go-to for any occasion. In a medium saucepan, heat the butter over medium-high heat. Add the flour and cook for a minute to make a roux. Whisking constantly, add the milk and cook a minute or so until mixture thickens enough to coat the back of a wooden spoon. Remove from the heat. Add the salt, pepper, 1/2 tsp Dijon, and the cheese (don't worry about getting the cheese to melt). Taste for seasoning. 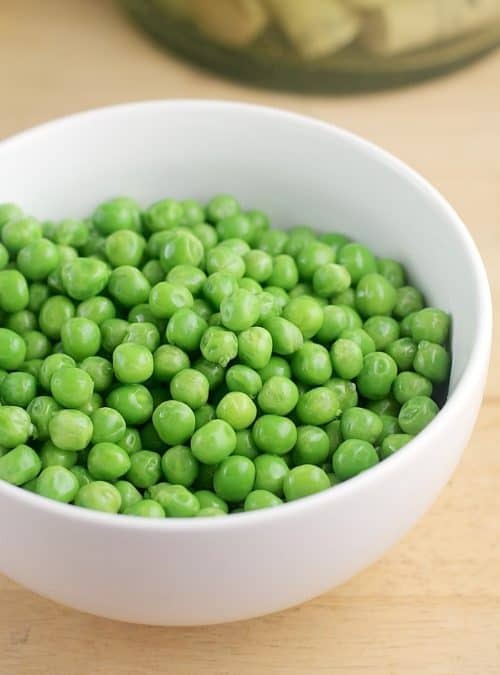 Add the ham and peas. 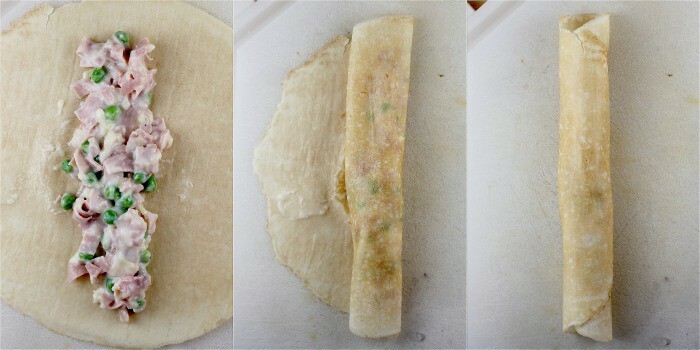 Lay out a crepe. Spoon ~1/4 cup ham filling down the center. Roll up the crepe and place in a large bake dish. Repeat with the remaining ingredients. Bake at 350F for 15-20 minutes or until heated through. Combine the sour cream, remaining 2 teaspoons Dijon mustard, and milk, to make a sauce. Serve drizzled over the crepes. Yields: 5 servings. Leave me a comment! Otherwise, I’m just talking to myself here. Do you do savory crepes? What a beautiful delicious recipe! I love how quick it came together and all of the fresh ingredients. I can’t remember the last time I had crepes. I wish our stores carried them – they’re such a hassle to make at home! These look so good!! I need to see if my grocery store has crepes! Yum and double yum! 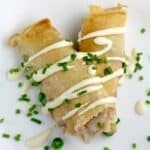 I love savory crepes, and I’ve never done peas in my crepes. Trying this one soon! What a delicious spring combination! This is a recipe my kids would eat up! I always want to look like a rockstar without working too hard! haha! Thanks for sharing, this is great!